Victorian tiles are a product of the gothic revival that occurred during the reign of Queen Victoria, these tiles are typically colourful and patterned, taking influence from medieval designs. 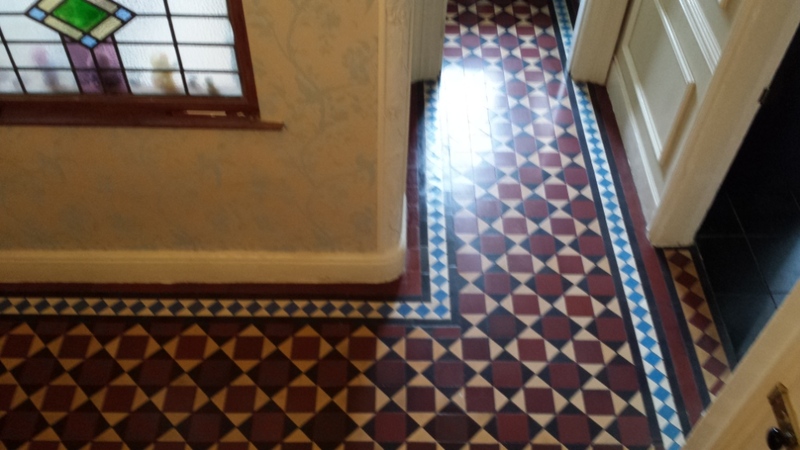 Many property owners in the 21st century understand the value original features such as these floors can have and have chosen to maintain these original tiles. 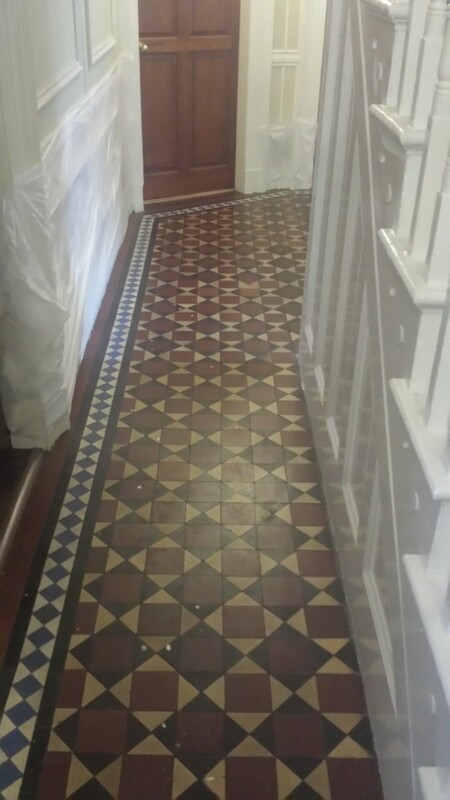 Restoring them however isn’t always an easy process and we often get asked to deep clean and seal these floors including the example below of a Victorian tiled hallway in the hallway of a grand house in Warrington where the old sealer had gradually worn off allowing the tiles beneath to become dirty and discoloured. Warrington is an area in Cheshire that expanded and urbanised during the Industrial Revolution period of the 18th and 19th centuries, with its major industries including steel and textiles. This coincided with the growing prosperity of the town, and as people grew wealthier they were able to build fantastic houses with equally fantastic Victorian tiled floors. To begin the restoration, I applied a strong dilution of Tile Doctor Pro-Clean, which is a high alkaline product, to both remove ingrained dirt and strip away any remaining old sealer that was still present on the tiles. It’s important to strip the floor of all old coatings and sealers to ensure optimum performance by the new sealer and also to avoid patchy results. The product was left to dwell on the floor for twenty minutes to break down the sealer and seep into the pores of the stone. I then scrubbed the tiles with a black pad and rotary machine to work the Pro-Clean deep into the tile. The resulting soiled cleaning solution was then removed using a wet vacuum machine and the floor was rinsed with water. There were a few stubborn areas that needed further work so these were spot treated using the same process and then followed this by neutralising anytrace of cleaning product on the tiles with a thorough rinse of water. I dried the tiles with the wet-vacuum once more before leaving them to dry out over the course of two days. Upon my return to the property I sealed the Victorian tiles using a combination of sealers which we have found is the most effective method of sealing Victorian tiles. 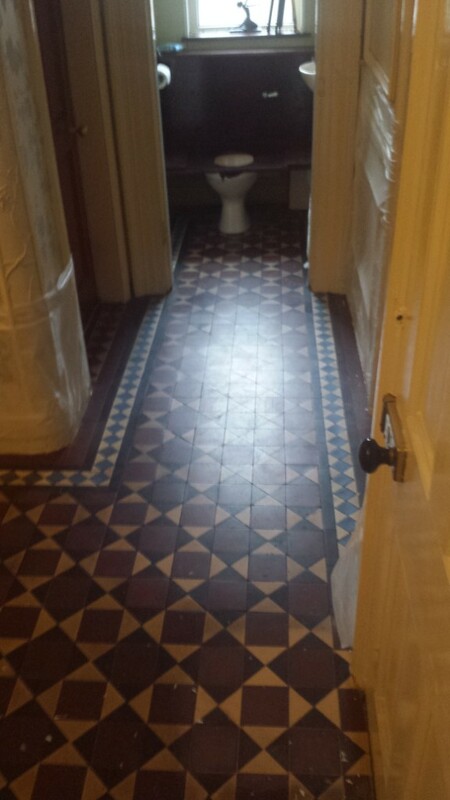 Firstly, I applied a single coat of Tile Doctor Colour Grow, which is a colour intensifying impregnating sealer that soaks into the tile and really lifts the colourful the Victorian designs. Secondly, I applied four coats of Tile Doctor Seal and Go, which provides a durable low-sheen finish (as requested by the customer) and will protect against dirt and stains. original Victorian tiles because the transformations are truly in incredible. It’s easy to see why so many people want to have them maintained because they really add character to any property. 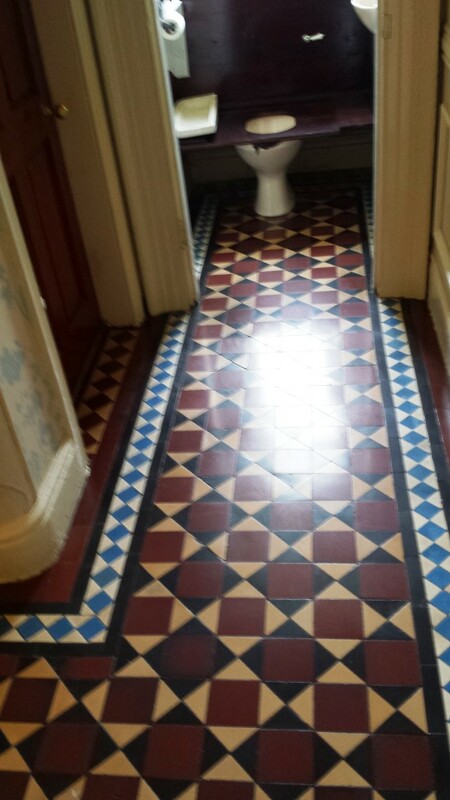 This entry was posted in Victorian Posts and tagged hallway, tile cleaning, tile sealing, victorian tiles, Warrington, west cheshire by AbzDominise. Bookmark the permalink. Alastair Robb is an agent of Tile Doctor, the largest Tile and Stone cleaning network in the UK who have developed the products and techniques to handle a multitude of issues surrounding tiled flooring including stone and grout.